A Red Cross volunteer carries a Syrian refugee baby off an overcrowded raft at a beach on the Greek island of Lesbos, Nov. 16, 2015. Some Republicans are pushing back against aggressive opposition in their party to Syrian refugees resettling in the U.S. 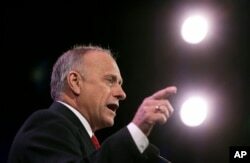 FILE - Rep. Steve King, R-Iowa, speaks during the Freedom Summit, Jan. 24, 2015, in Des Moines, Iowa. Former New Hampshire Republican Party chairman Fergus Cullen said there is “a little bit of ugliness” around the refugee debate. The administration announced that goal earlier in the fall after a photograph of the body of a little Syrian boy washed up on a beach sparked calls for compassion, including from some congressional Republicans. Sen. Lindsey Graham of South Carolina, a Republican candidate for president, was one of those who supported accepting more Syrian refugees. This week, he called for a “timeout” in such admissions. Tea party leader Mark Meckler said there should be no room for debate.